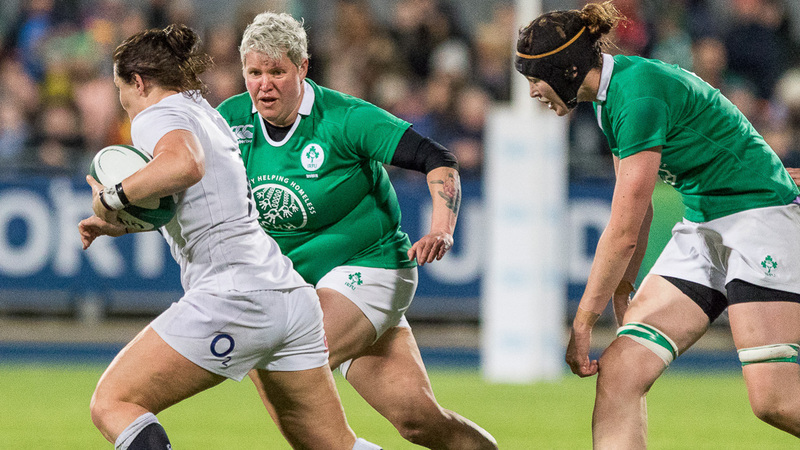 The 2017 Women’s Rugby World Cup kicks off in Dublin on Wednesday 9th August before moving north to Belfast for the knock out matches starting on 22nd August. Between now and then we will be bringing you interviews with the Ulster players involved in the World Cup Training squad. We start off our coverage with a chat with Cooke Women RFC’s Ilse van Staden. It’s been a long road for Ilse van Staden in pursuit of her dream to play rugby at the highest level, a dream that will hopefully be fulfilled this August should she be one of the select few to pull on the green jersey at the 2017 Women’s Rugby World Cup. I caught up with Ilse last month at Ballylagan Organic Farm, Straid, where she works as a butcher. The farm specialises in producing organic meat and vegetables for the local community and beyond. Sitting in the sunny and sheltered courtyard where we enjoyed an organic tea and scones from the Tea House I asked Ilsa how she got started with rugby? “I took up rugby as an off-season sport while I was playing softball. A friend invited me over to, what was then, Correctional Services Rugby Club, Pretoria, to “Give it a Try” and the bug bit. Three weeks later I stopped playing softball completely. “I played my first game for Correction Services in March 2002 and, as happens when you are really rallied up, it went fairly well and I got my first Provincial cap six months later with the Blue Bulls. Did you always play in the front row? Did you go beyond provincial level in South Africa? What brought about the move to Northern Ireland? “I moved to Northern Ireland in 2011. I’d met some of the Ulster Women’s players on an exchange programme in South Africa and they persuaded me to come over, telling me the rugby was great here. I played my first two seasons at Belfast Harlequins and then moved to Cooke in 2013. 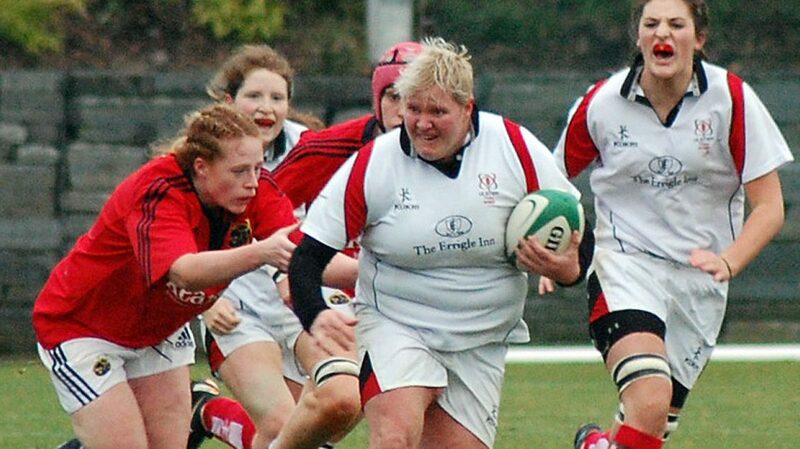 Ilse in action in her first cap for Ulster against Munster in 2012. I covered that Inter-provincial series for the Front Row Union and it was a good competitive series for Ulster Women, with Ilse to the fore. However, in subsequent seasons her rugby career didn’t seem to be kicking on and there was a feeling of unfulfilled potential; until a virtuoso performance in the 2016 Rosie Stewart Cup Final, for Cooke against Queens, brought her screaming back to my attention. I asked Ilse what brought about the change? “In December 2015 I went back to South Africa for Christmas and I spent a bit of time in Pretoria by myself. I remember phoning Dr Eugene Hayes, the main guy at the Blue Bulls Rugby Union, and I asked him if I could go and have a sit about at the stadium. “I said to him that I’ve been playing rugby over the water and I have to decide what I’m doing. Am I going to carry on playing rugby or am I going to give it up and focus on all the other things? He sat down next to me and said, “Sometimes all you need to do is change your perception, change how you look at things and that includes changing your attitude.” It was my light-bulb moment. “The next morning I was back on the plane to Northern Ireland and I decided that I have two or three years If I wanted to do something so I decided I was going to throw everything, and the kitchen sink, at it. So was it all plain sailing from there? “Not exactly! After the 2016 Inter Provincials, I’d done a much as I could so I was hoping that I’d been noticed but there was no call-up for the autumn internationals so I just continued to focus on enjoying my rugby. “Then on 2nd January 2017, I got a letter from the IRFU and I joined my first Ireland Rugby Camp on 8th January and from there it just snowballed. I got my first cap against Scotland in February and I’ve been involved in every game since then. If someone had told me on Christmas Day 2016 that I’d be playing against England in Dublin on St Patrick’s day I wouldn’t have believed them. It all happened really quickly. So who among the players has been your biggest influence? “Lindsay (Peat) and Ailis (Egan) have been very helpful. I have huge respect for them as players and people. Before getting into the squad Grace Davitt (at Cooke) was a massive, massive help. If I needed any advice I could just ask Grace and she pushed me really hard. Sometimes I felt it was too hard (laughs) but it was all for my own development. And how are you finding time to mix all this extra training and work? 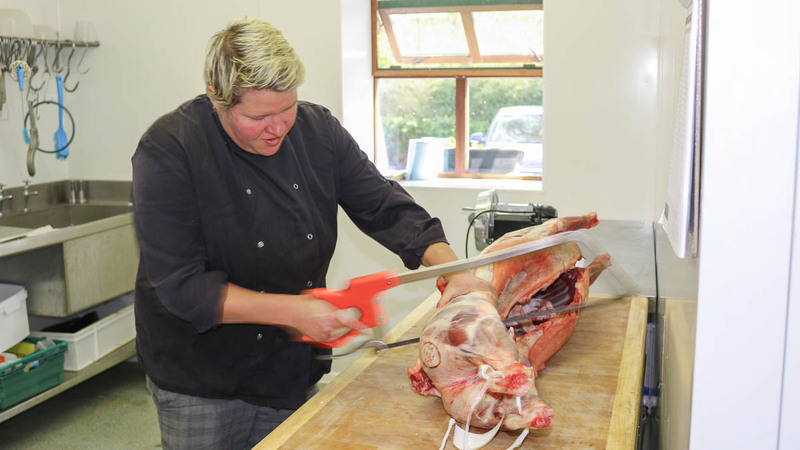 “I’m in a fairly physical job, being a butcher, and I’m very lucky to be working at Ballylagan Organic Farm. “The owners, Tom and Patricia Gilbert, have been very supportive. They made the journey down to Dublin for the game against France to support me which was wonderful. They have gone above and beyond what I could ever have expected. Ilse at work at Ballylagan Organic Farm. “Tom is very proud of the fact that I’m the only butcher at Ballylagan Farm to have played for Ireland (laughs), I don’t know who’s the proudest, my parents or Tom. It’s been a long journey, figuratively and literally, for Ilse over the last fifteen years and I’ve been fortunate to document the last six years at The Front Row Union. In our chat, Ilse used the expression, “ What is for you won’t pass you by”. And I’m sure after the monumental change she made to her lifestyle in recent years that this chance to play the sport she loves at the highest level won’t pass her by. As Ilse said, “We don’t select ourselves, we work to make ourselves selectable.” She can do no more but I’m sure it’ll be enough! Don’t miss out on the 2017 Women’s Rugby World Cup. There are still tickets available for the knock out stages. Click here for details.